This weekend, protesters in numerous countries surrounded government buildings and demanded that the elected officials resign rather than implement new ‘austerity’ measures. Photo from Occupy Wall Street website. 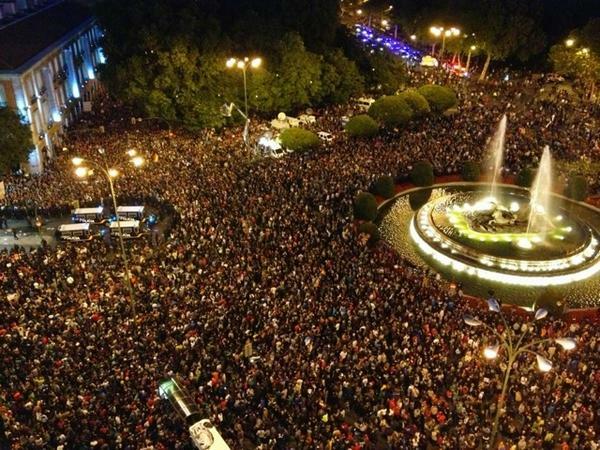 Those of you who saw my blog post on the 27th know that I wrote about big street demonstrations in Madrid on the 25th. Well, you’d be hard-pressed to know it, but all weekend there were big street protests against ‘austerity’ in the Euro Zone. Here was the call to action in Spain. On Saturday, September 29th, big protests occurred in Spain, Greece and Portugal, with smaller protests in London, Rome and the Netherlands. A new tactic of global resistance is emerging (quoting from news releases): “Surround the Congress.” Following #25S, when thousands of protestors converged on Spain’s parliament building in Madrid to denounce austerity and the kidnapping of popular sovereignty by the Troika and the Markets, similar actions will take place Saturday September 29th across Spain and in a number of European capitals, including Rome, Lisbon, London, Brussels, and Amsterdam. With momentum behind the new tactic growing, AdBusters has called for an October 31 “Halloween Party” on Capitol Hill. Where are our protests? We’re four years into a financial crisis that if you count unemployment the way it used to be counted would be in the 17% range, and with the exception of the Occupy movement, nobody’s in the streets. Housing crisis is the same deal–trillions in equity wiped out, nobody has gone to jail. No trials for banksters, even for new crimes like the LIBOR scandal. And every American paid some kind of penalty for Libor when municipal bonds issued by their cities and states had their interest rates changed due to the rigging. There will be a presidential debate three days from now. The moderators might ask Romney/Obama what they think about doing away with Habeas Corpus via the NDAA, but they both agree with its passage. Obama has secretly negotiated a trade deal called the Trans Pacific Partnership that has been called ‘NAFTA on Steroids’–it would allow corporations to override local laws and environmental regulations, with opinions that cannot be reviewed through the courts. A discussion on TPP would make for a lively debate, except that Romney also supports its provisions (where’s Ross Perot when you need him?). Per Lori Wallach of Global Trade Watch, the US has lost some 5 million manufacturing jobs since the institution of the WTO. That doesn’t count the hundreds of thousands of off-shored jobs in information technology, customer support, engineering and architecture and a whole slew of technical fields that paid salaries enough to support a middle class. We need to surround the Congress. Sooner rather than later.